Sustainable Production Practices | Walters Gardens, Inc. Growing Green: Sustainable Production Practices at Walters Gardens, Inc.
Sustainability isn't just a buzz word at Walters Gardens, Inc.—it's the way we do business. 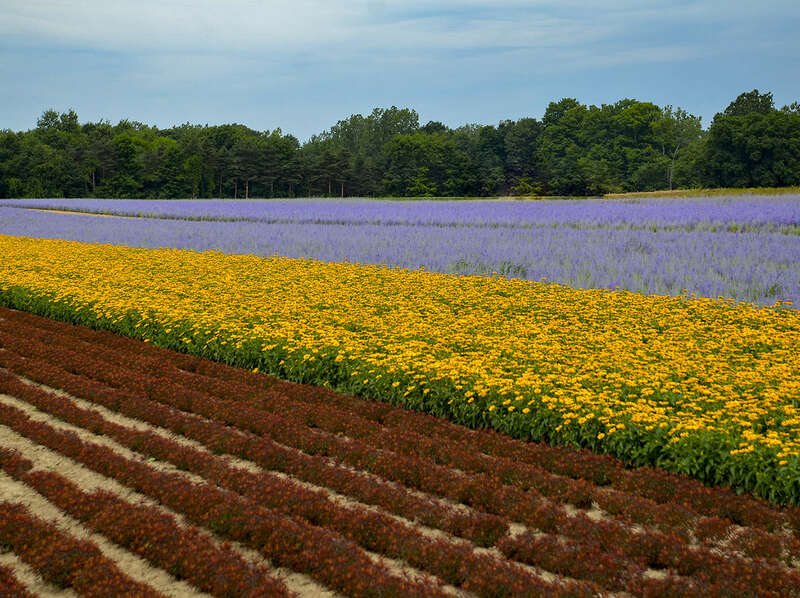 Now in our 70th year, we have made a solid commitment to sustainable production practices in order to maintain the quality of the environment in which we grow perennials. We're looking forward to doing business right here where we started in Zeeland, Michigan, for another 70 years. Profitability can go hand in hand with sustainable production; doing what's best for the earth can also be very good for business. Read on to find out how. Crops are grouped by cultural requirements in our fields. As the largest field grower of bare root perennials in the country, we have a vested interest in protecting the viability of our fields. Field grown plants have a reduced carbon footprint since there are no plastic pots or trays involved in their production and the sun's energy is the only source of heat required. We have adopted a number of sustainable growing practices, starting with good soil. Recycled plant waste from our processing department as well as cover crop material is regularly plowed under to build up the organic content of the soil. Crops are rotated annually, planted with perennials for one year and then with a cover crop such as corn, wheat, or sorghum for two years. Visitors have remarked how clean our fields are, thanks to our weeders who diligently hoe on a regular basis. Windbreaks and cover crops reduce the amount of soil erosion. In field production, we group our plants both by soil preference and watering needs. Drought resistant crops that prefer lighter sandy soil are grouped together while those that prefer more moisture and heavier soil are planted in other fields with those conditions. By grouping the plants by their moisture needs, we can deliver the exact amount of water they need with little waste. Though this takes more time for us to plan and coordinate, we are committed to the sustainable practices of doing what is best for the plants and for water conservation. We have invested in high tech, energy efficient linear irrigation machines to water many of our field crops. Linear irrigation delivers water very evenly so the crop grows more uniformly. It also produces very fine droplets of water that don't compact the soil upon impact. This results in healthier roots and less need for tilling. Just before our field plants are dug for orders or storage in the fall, the top growth of many varieties is cut back with a weed trimmer. This used to be done by hand after the plants were dug; it would take four people a total of eight hours to trim one crib of plants. Now, it takes one person only 15 minutes to trim the same amount of plants in the field. Another important benefit of field trimming is that the bare root plants store better without top growth, resulting in higher quality plants. The switch to Elle Plugs has contributed greatly to our sustainable growing efforts. Overall, we have found that Elles require fewer inputs to grow a saleable plant, saving us time and money each step of the way. Our growing time has been notably reduced, with some crops finishing up to 60% faster than they did in plastic pots. The crops are incredibly uniform, stronger and therefore less prone to disease, and of better quality overall. Understanding the vital importance of plant health, we remain vigilant in preventing problems in our fields. Before a crop is ever grown in the field, we make sure our planting stock is clean and disease-free. We then diversify our plantings so that disease prone items are never planted in the same place twice. All of the equipment used to plant and harvest our Hosta stock blocks is sanitized between cultivars. We also scout weekly for weeds, insect damage, unusual variations in growth, and overall plant health. By scouting often, we can catch problems early before they become widespread and require more inputs to fix. As in the fields, prevention is key when it comes to pest and disease management in our greenhouses. We do weekly scouting for any pest, disease, or nutritional issues and do some preventative spraying in wide intervals to prevent disease. When you tour our greenhouses, you'll see yellow sticky cards dispersed among our crops; they are our eyes when we're not looking. 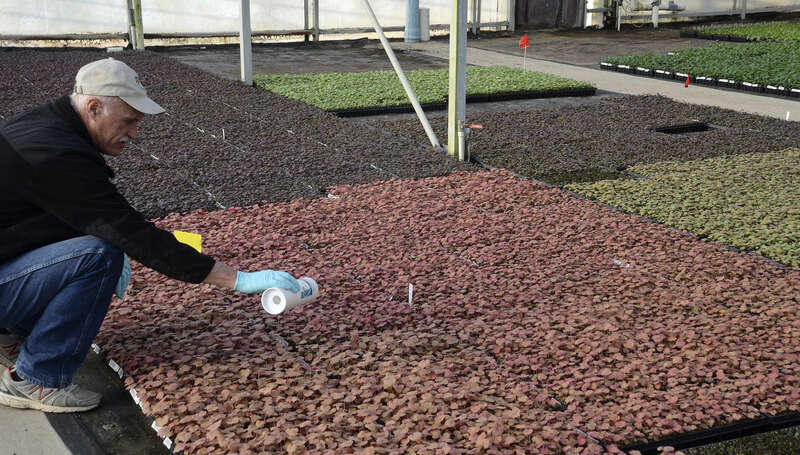 Our goal is to catch problems at the earliest stage possible and to target the treatment to the specific crop before it spreads to other plants. Fewer inputs are needed if the problem is caught early, saving us time and money on labor and chemicals, and helping us to grow in a more sustainable manner. When chemicals are necessary, we try to use reduced risk pesticides which target specific pests rather than using a broad spectrum chemical that kills both harmful and beneficial insects. We also do our best to rotate pesticides with different modes of action to curtail resistance. 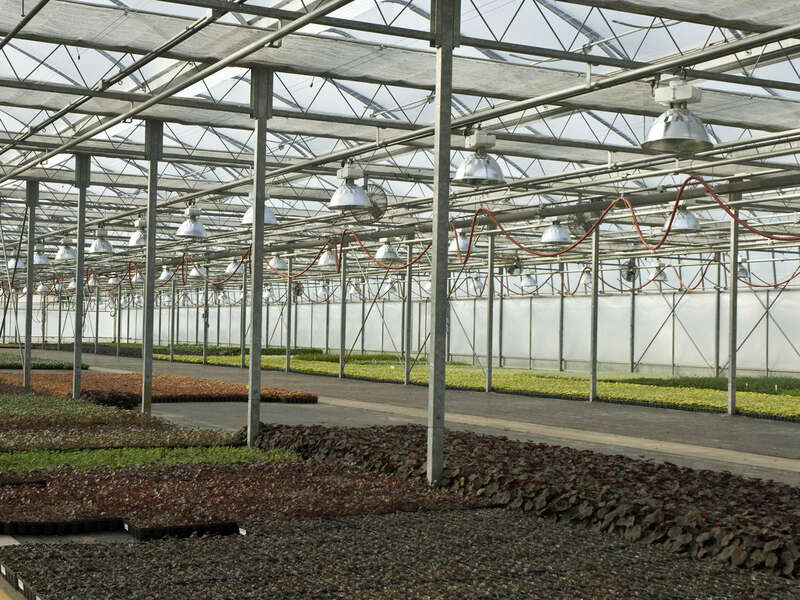 Upon analyzing our greenhouse production practices, we realized there were many opportunities for increased efficiency. Over the past two years, we have invested heavily in automation equipment to support the production of our new Elle Plugs and to streamline our greenhouse production. The entire streamlined process of our Elle Plug production is now contained in one large room in our greenhouse facilities. On one side of the room, a machine makes the Elle Plugs and sets them in the trays. A vacuum dibbler then extracts the core of each Elle to create a cavity to receive a smaller production-sized Elle. The extracted soil is reused to make more Elle Plugs. The vacuum dibbler prevents soil compaction, resulting in healthier plants. The dibbled Elle Plugs are then sent down the line to stuck with smaller production-sized Elles and watered. After being watered on the line, the trays are sent back to the greenhouse for growing on. On the other side of the room, a sticking line is connected to an Elle Plug machine that makes our smaller production-sized Elles. On this line, the Elle Plugs are made, dibbled, watered, stuck with cuttings, labeled, and sent back to the greenhouse in one streamlined process, saving us space and time. To insure our customers receive top quality, uniform plants, all of our perennials are sorted and inspected throughout the growing process. With plastic pots, this could be a struggle if plants became root bound. Our sorters have given rave reviews of our new Elle plugs because they easily pop out of the trays for inspection, resulting in less wrist stress and risk of injury. 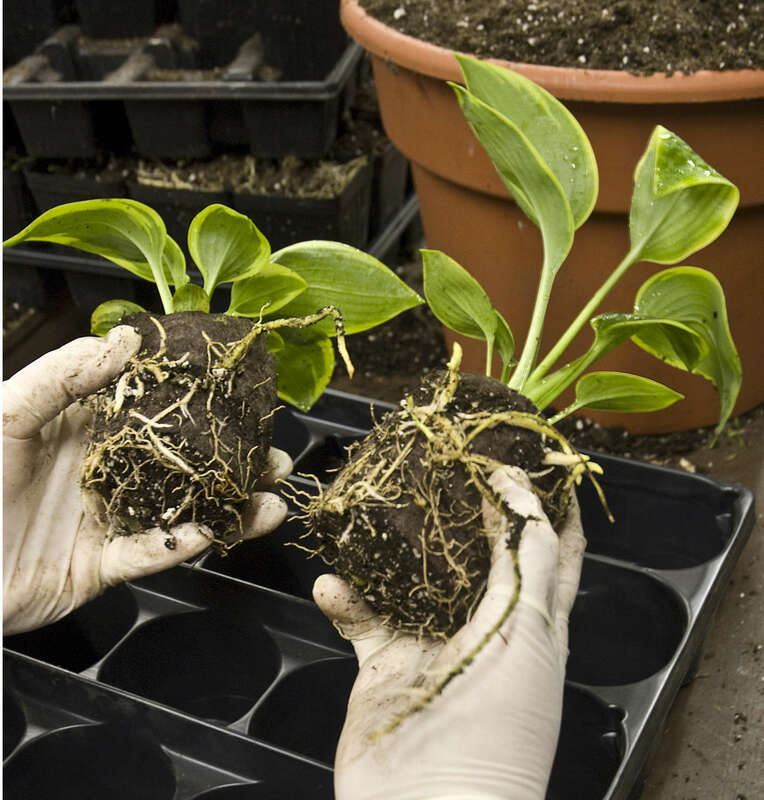 In the hosta department, plants can now be sorted up to 50% faster which is critical since we ship over a million hostas per year.